It’s been a stressful month and I’ve had a challenging time finishing the ‘serious’ books malingering on my shelf. I recently picked up my Kindle (after charging it–I really prefer paper) and discovered this little gem hidden near the end of my title list, one of those bargain purchases I was saving for a rainy day. Or snowy day. Whichever–I think we’re going to have both tomorrow–thunderstorms and eventual snow. 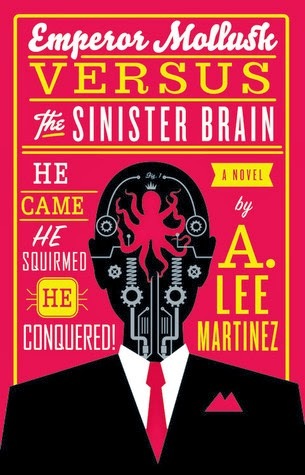 At any rate, I rather enjoy A. Lee Martinez’ books, but I recognize they work best for a certain kind of mood, the mood that wants fun, clever, and even silly, with feel-good endings. Emperor Mollusk perfectly fit my mood, and to my surprised, proved almost impossible to put down. Think every sci-fi/horror pulpy trope of the 1960s. They’re here, and they’re hysterical. But what’s even better is that Martinez takes this beyond parody by exploring evil, ethics and science through very human inhuman characters. Poor (former) Emperor Mollusk. He’s been exiled from his native watery planet of Neptune, Saturnites hate him, and “the Venusians had had it in for me since I’d tried to conquer their planet after falling short on Neptune. I hadn’t really come close to subjugating Venus. Only claimed a couple of continents for a few weeks. No reason they shouldn’t have been over that by now.” Luckily, he conquered Earth Terra, so he still has somewhere to live. But even an Emperor of a world can get a little dull after you’ve solved a few of humanity’s larger problems. He’s trying to back down from the emperor thing and live a quiet life pursing his scientific research. He’s on a grocery store run when his reptilian Venusian arch-enemy arrives, Commander Zala. She wants to take him into protective custody, much to his surprise (he was expecting her to ‘bring him to justice’). Venusian intelligence has discovered a plot to assassinate Mollusk, and she considers it her duty to protect him until he is legally sentenced to death in Venusian court. Mollusk has no intention of going to Venus just to avoid another minor assassination attempt, so Zala assigns herself and her team as his bodyguards. The first attempt comes at his townhouse, and Mollusk, Zala and Mollusk’s faithful pet ultrapede (evil geniuses need disgusting pets) are soon investigating a trail of sinister clues that take them through classic B-movie sets as they seek to uncover the assassin and foil his sinister plot to rule the universe. Giggle. Yes, it’s a variety of parody. But it’s elevated above simple mocking by heart, fun characterization, and an anti-buddy antagonist coupling that was fun to watch. And, I shudder to admit it, but I rather liked the ultrapede and her tendency to shriek with enthusiasm. Martinez surprised me with what he did, and I ended up devouring the book in a day. Consider it highly recommended, with the caveat that it be read with tongue firmly in cheek.